Tonight’s video is a flash back to the second episode of Radio Free Charleston, from July 2006. “RVD Shirt” features music by Stephen Beckner and The Sleeping Dons (Sean Richardson, Jay Lukens and Deron Sodaro), animation by Frank Panucci and a sneak peek at the then-unreleased Batman movie. 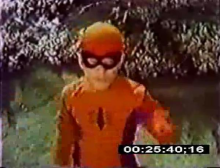 This episode also marks the first appearence of the infamous Dancing Midget Spider-man (seen right). You can read the original production notes here. RFC 153, “Dr. Pepper Shirt,” with rehearsal performances by Melanie Larch, Lady D and The cast of “Jesus Christ Superstar” will be posted here tomorrow evening.